Web Video Launch offers monthly campaigns to drive leads for sales organizations through search engine optimization (SEO). It's power is in the disruptive technology of web video. Only WVL offers an industrial launch capacity to propel your videos and web links to the top of the search engines. Stop paying for clicks and start acquiring your spots on Google, Yahoo, AOL, MSN and other important sites. Get a monthly campaign using the Web Video Launch process©. With a 90 hour weekly work schedule, WVL concentrates on uploading web videos according to keyword and keyword combination targets. First, WVL has the fastest video rendering machines on the market, each loaded with high-grade video editing software for rapid deployment to the web. 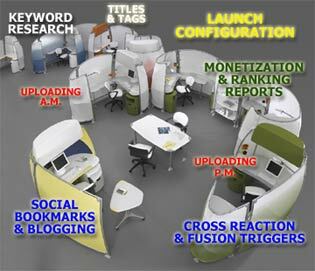 Each tech is then cross trained in direct marketing, SEO, and total quality management. Next, WVL has two separate T-1's for uploading at a high rate. Third, Web Video Launch has multiple tools for the bulk uploading of web video on an industrial scale. Lastly, WVL offers an affordable, economy-of-scale that your IT expert or an SEO specialist would have to add staff, train and concentrate upon to find the same level of success. Hit the right button and results are instantaneous. Finally, WVL has years of experience across multiple client categories that you will not have to repeat nor overcome. Unless you currently perform thousands of web video trials each month, please don’t try this at home. PS: Targeted Web Video Campaigns provide SCALE , TARGETING and CONVERSION for sales organizations.